Home » Posts Tagged "SB 212"
Keep Those Notes Coming! Or Visit the Capitol Tomorrow! Senate Commerce Committee Chair Julia Lynn had planned to work both SB 179, the bill gutting collective bargaining under PEERA, and SB 212, the bill banning the use of payroll deduction for public employee association or union dues. This morning, in a committee room packed with public employee representatives and teachers in red shirts, Lynn chose only to work SB 179. And after a motion was made to pass the bill out of committee, Lynn announced they would take a “pause” and wait until tomorrow to vote and work SB 212. The committee will reconvene tomorrow morning at 8:30 in room 548-N. At that time they will consider both bills. There is some thought that they may be considering rolling both bills into one mega anti-public employee bill. Can you think of a more patriotic way to spend a day of spring break than visiting the Capitol to hold legislators accountable? There were more than 25 teachers in the committee room this morning. And if you can’t be at the Capitol, be sure to email the Committee. Click here to send a message on HB 212. The House Education Committee held a hearing on SB 70, a bill that would require all teachers to be fingerprinted and go through a KBI background check upon every license renewal and all other school employees to do so every five years. Since 2002, all new teachers have been fingerprinted and subject to a background check in order to get a license. Current law also requires teachers licensed prior to 2002 to be fingerprinted and checked upon their next license renewal. Very few teachers, if any, have not completed this requirement. While KNEA has no objection to background checks, we believe that repeating this every five years with fingerprinting is not necessary. The KBI Rap Back program is sufficient for notice to districts of licensed employees who subsequently are convicted of a crime. This bill would simply at $50 to the cost of a license renewal every five years. Interestingly, the “innovative school districts” are required to pay the cost under the bill while all other teachers must bear the cost personally. The bill has passed the Senate and will likely be worked in the House Education Committee tomorrow. The Senate Commerce Committee will be working SB 212 and SB 179 tomorrow morning. Both bills are harmful to public employees and opposed by KNEA. The House Education Committee will work HB 2139, repealing in-state tuition for the children of undocumented aliens, tomorrow. On Friday they will meet at 10:30 am (pre-KU basketball) to work HB 2292, the bill that would end use of the common core standards, AP tests, and the International Baccalaureate. Anti-Common Core Bill First Up Tomorrow! TAKE ACTION TONIGHT, SHOW UP TOMORROW! Senate Commerce Committee to take up payroll deduction, collective bargaining bills tomorrow morning! Senate Commerce Chair Julie Lynn, after the hearings on SB 212 that bans payroll deduction for association or union dues by public employees and SB 179 that essentially ends collective bargaining for state and municipal employees, told the press she likely would not work the bills. But somehow, she seems to have had a change of heart. She plans to work both anti-union, anti-public employee bills in the Senate Commerce Committee tomorrow morning. Both bills are considered to be political payback for the pushback public employees have given the legislature and governor over the reckless income tax cuts and public employee engagement in the 2014 elections. The committee meets tomorrow morning at 8:30 in room 548-S. We can’t think of a nicer way for Topeka area teachers to spend an hour during this glorious spring break! And if you can’t be there, you can phone and email the members of the Senate Commerce Committee. You might want to share some of our points on SB 212 with members of the committee. I believe that it is my duty as a professional to be actively involved in my professional association because doing so strengthens teaching and learning conditions, offers a mechanism for problem solving and most importantly gives me a solid platform from which I can advocate for my students. Previous changes to the dues deduction process restricted the use of dues for political activity. Far from strengthening my paycheck, this bill seems punitive and restricts my colleagues and myself from making choices as consumers particularly when the restriction does not apply to other organizations. I voluntarily choose to be a member of my professional association, just as I would voluntarily choose to contribute to United Way a 403B investment product or AFLAC as an insurance provider. This bill legislates that as a teacher I am permitted to give via payroll deduction to organizations that meet a specific viewpoint but not to one that meets my own personal viewpoint. Links to the Commerce Committee members’ emails are below. 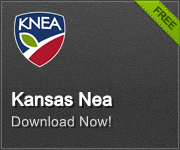 Click here to use the KNEA contact your legislator portal! On final action today, the block grant school finance plan was passed on a vote of 64 to 58. This bill, which is opposed by the education community and supported only by Americans for Prosperity, the Kansas Policy Institute, and the Kansas Chamber of Commerce, entirely repeals the current school finance formula and replaces it with a nebulous “block grant.” Schools would receive no more funds than they do this year for the next two school years. But most schools would actually lose funding under this bill. The bill has been characterized as loaded with false promises supported by imaginary runs. Since this bill is a policy bill and not an appropriations bill, whenever it says “it is appropriated,” what it really means is “later on we might fund it if we can put together a comparable appropriations bill.” And unless the Legislature solves the current budget and revenue disaster brought on by the Governor’s reckless tax cuts. If they can’t find a way to fill the very deep revenue hole created by the tax plan, there is no way they can pay for this bill. During floor debate, opponents of the bill pointed out that those who support the bill (KPI, AFP, and KCC) are the same three organizations that told Legislators to pass the income tax cuts in 2012. Under a call of the House, no Legislator may leave the House floor and the missing members are called to come back and cast a vote. The waiting time is used for arm-twisting and bargaining. After a couple hours, Rep. Todd returned and Rep. Bruchman was “found.” They cast votes in favor of the bill and it passed. Below you will find a list of how each legislator voted. Please feel free to thank those legislators who stood up for Kansas schools by voting NO. As for those who voted YES, you might want to let them know how much you are looking forward to their support for revenue enhancements that will make the false promises of SB 7 into realities. You can get their emails by clicking on their names below. Governor flies in Virgil Peck! Virgil Peck was excused from the Legislature today to join the Governor in Coffeyville for an event. When the call of the House went out, Peck was put on the Governor’s plane and flown back to Topeka. Unfortunately for Peck, he arrived too late to cast a vote! See the story here in the Lawrence Journal-World. The Senate Commerce Committee held a hearing on SB 212, a bill that would prohibit the use of payroll deduction for public employee union dues. KNEA joined the Kansas Organization of State Employees, AFT, the Fraternal Order of Police, Superintendent Julie Ford of Topeka USD 501, Superintendent Martin Stessman of Shawnee Heights USD 450, and a number of state employees in opposing the bill. KNEA was represented by General Counsel David Schauner, teacher Nathan McAllister of Royal Valley, and school librarian Kate Thompson of Olathe. Supporting the bill was the usual gang – Americans for Prosperity, the Kansas Chamber of Commerce, and the National Federation of Independent Businesses. The KCC was represented by Eric Stafford who, when a similar bill was heard a few years ago, blurted out “I need this bill to get rid of public sector unions!” One can only assume that’s still why AFP, KCC, and the NFIB want this bill. We are sure it has nothing to do with the bill’s title “Strengthening Protection of Public Employee Paychecks.” You know, because you need to be protected from yourself! This committee also had a hearing on SB 179 which would effectively end collective bargaining for state and municipal employees around Kansas and eliminate the Public Employment Relations Board where management and labor work out conflicts. KNEA also opposes SB 179. Committee chair Julia Lynn (R-Olathe) has told the press that she is not sure if the committee will work the bills. We’ll be keeping an eye on them. This morning the Senate Commerce Committee held a hearing on SB 179, a bill that dismantles the Kansas Public Employee Employer Relations Act (PEERA). PEERA is the law regarding collective bargaining for public employees other than teachers. Teachers are covered under the Professional Negotiations Act. SB 179 would allow public employees to negotiation only minimum salaries, eliminate the Public Employee Relations Board, ban mediation and fact finding, and put whether or not a municipality could bargain with employees to a public referendum. KNEA joins other public employee organizations in opposing this bill. In a show of just how Committee Chair feels about the bill, the three proponents were allowed 20 minutes of time to address the committee while opponents were allowed one minute each. We wonder if you can guess who were the proponents? Tomorrow the same Committee will hold a hearing on SB 212, a bill that will prohibit public employees from using payroll deduction to pay Association or Union dues. They laughingly call this “Strengthening Protection of Public Employee Paychecks Act” because, as you know, public employees must be protected from themselves and who better to do that than the Kansas Policy Institute, the Kansas Chamber of Commerce, and anti-union legislators? Click here to urge the Committee to vote NO on SB 212. Remember the old Viking movies when they ordered the oarsmen to work at “ramming speed” when attacking an enemy ship? Well, that’s a lot like the legislative process being used to pass a school finance bill that no one in the education community supports. Oh, the bill does have supporters – the Kansas Policy Institute, the Kansas Tea Party’s Kansans for Liberty, and the Kansas Chamber of Commerce. It just doesn’t have the support of school boards, superintendents, school administrators, teachers, the Kansas PTA, Game on for Kansas Schools, and every other group associated with public education in Kansas. Unveiled at a Thursday press conference, the bill was available to be read on Friday. The hearing was Monday morning. Crammed into Senate Bill 7, it was passed out of Committee Tuesday morning. It will be debated on the floor of the House tomorrow. RAMMING SPEED! The Legislature has spent years debating and pondering whether or not supermarkets can sell beer but only five days on the financing of the state’s entire system of public education! Some folks believe that this plan is not so bad in that it seems to keep schools from losing millions more over the next two years. But that’s simply not true. Even Senate Ways and Means Chairman Ty Masterson (R-Andover) admitted during the Senate hearing on the plan that there were no guarantees that the funds would not be cut. The state budget, after all, is in something of a crisis and there have been no efforts to fix the drying up revenue stream. And without that fix, nothing is guaranteed. Click here to urge your Representative to vote NO on SB 7, the Block Grant bill. Suggesting that excellent teachers should stay in their classrooms instead for working state-wide, Rep. Jerry Lunn (R-Overland Park) has proposed HB 2378, a bill which would create a legislative teacher award program. A small group of business leaders, legislators, and principals, most of whom are political appointees, would select 15 teachers they considered excellent and provide them with large financial awards to the limit that they could generate funds. These teachers would not be ambassadors of great teaching as are the current teachers of the year. This bill would also end the current Teacher of the Year program which has been in place since 1955. The Kansas TOY program has been a model for those in other states. Many of the most conservative legislators around the room expressed the sentiment that Kansas teachers are underpaid. We agree. Teachers ARE underpaid. In fact, Kansas ranks 42nd in the nation in teacher salaries. Truth is they really are interested in only rewarding a few and getting their photo in the paper with one of those 15. We would suggest that a good way to start rewarding excellence would be to fund the Nationally Board Certified Teachers program that hasn’t been funded in years. That program would benefit many teachers who have demonstrated excellence. The Committee plans to work the bill tomorrow.